The CEDS Data Model includes a hierarchical schema of non-technical domains and entities with each CEDS element in context, and a fully-normalized logical model. Later releases of CEDS will expand the domains and add additional elements and content within the current domains. Entities are commonly thought of as persons, places, events, objects, or concepts about which data can be collected. An entity provides context for a data element. Some examples of entities are Early Learning Child, K12 Student, K12 Staff, Postsecondary Student, Postsecondary Institution, etc. There are over 70 entities in the DES. CEDS supports standardizing educational organizations and their relationships with other organizations, people, and time. The Normalized Data Schema is a reference model for operational implementations aligned to the CEDS standards. The P-20W focus of CEDS is supporting a transition from siloed, domain-specific, or location-specific, data sets to data that is compatible across domains and geographic boundaries. In addition to existing state and federal reporting and for analysis and comparison of aggregate statistics, the standards support data that moves with a learner from an early learning program to K12 to postsecondary to adult education and workforce learning programs. The latest release of CEDS also focuses on use cases that support people’s relationship with learning processes — the inputs, process steps (work), and outputs of learning — beginning with learning standards and assessments. 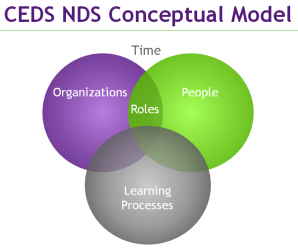 The NDS is a 3rd normal form structure organized around the key concepts of organization, person, and role. The NDS was developed with the goal of supporting physical implementations that could function as an “operational data store” for integrated P-20W data providing the most current available view of each organization, person, and role. At the intersection of organizations, persons, and learning resources are key learning processes. 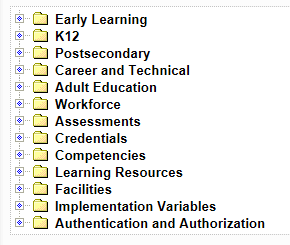 CEDS includes learning resources and process data elements definitions, such as learning standards, learning goals, learner assignments, learner activity, and learner achievements. Also defined in CEDS are the data elements and relationships covering formative, summative, and benchmark assessment processes. These documents are a printable representation of the CEDS (version 7) Data Model, and include entity relationship diagrams, case studies, and the normalized data schema tables and fields.